Please use the information below as a guide. The retreat below is NOT available. Details on our next retreat will be released soon. Trading Retreat in October 2017 – Marbella! We are heading to the H10 Andalucia Plaza Hotel in Puerto Banus, one of Marbella’s most exclusive areas for 4 days. The H10 Andalucia Plaza is a beautiful hotel with outstanding restaurants, bars, pools, spa and lovely spacious rooms. Enjoy some sunshine and have some fun! The Trading Retreat will be a mix of business and pleasure. We have crafted an agenda with 4 mornings of live trading, strategies and tuition, followed by breakout sessions in the afternoon or free time for you to relax. You might want to sunbathe at the pool, go to the beach, explore the Marina in Marbella or one of the incredible restaurants on site. Trading in the sun went well for the last group on February’s retreat – they made money in the mornings, gained confidence with great education and spent the afternoons enjoying the sun! The trading retreat will be led by Lee Sandford and Headcoach Federico Bustos and includes strategy training and live trading sessions as well as student led lessons to ensure your preferred topics are covered and your trading progresses. This course is suitable for traders of all levels. The retreat in February took us to Lanzarote to a stunning 5* hotel. For this retreat we have taken a slightly different approach. The retreat HQ will be at the H10 Andalucia Plaza Hotel in Puerto Banus. We have secured preferential room rates for our students (depending on availability). However, we have also scouted the area for other hotels with a range of prices to suit all students. We do not have preferential rates, nor are we affiliated with any of the other hotels but here are a few hotels you might want to consider for your accommodation needs. If you wish to stay at the H10 Andalucia Plaza Hotel where the retreat is being held, we have secured preferential rates for our students for €149 per night. This rate includes breakfast. IMPORTANT – To book a room here, please inform us and we can send you the relevant form where you can fill out your reservation and payment details for us to send on to the hotel to guarantee this rate. Only 10 minutes from the Trading Retreat H10 is Club Jardines del Puerto which is set in a residential apartment complex with a large garden and outdoor pools. Club Jardines del Puerto is one of the most central hotels in Puerto Banus with spacious apartments and 4 outdoor pools. It is only a short walk from the retreat and the main town. 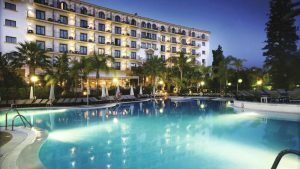 Barcelo Marbella is a recently refurbished 4 star hotel in Guadalmina, only 15 minutes drive from H10 Andalucia and has 2 swimming pools, bars, a wellness centre with a sauna and steam room and is close to a golf course, other sports and water sports. The hotel also offers an all inclusive programme offering a range of dining options, full board and snack service, alcoholic and non-alcoholic drinks and night time entertainment. The Hotel PYR Marbella is located in Puerto Banus, only a short 15 minute walk to the Trading Retreat HQ. Hotel PYR offers an excellent alternative to the H10 for your accommodation needs. Hotel PYR offers its guests 2 pools, tennis and paddle courts, WiFi, cocktail bar and its on site Restaurant Mediterraneo if you don’t fancy the short walk into the main town. Hotel NH San Pedro de Alcantara is a 3 star hotel and is located 15 minutes drive from H10 Andalucia. It is in the heart of the shopping area and only 10 minutes to the beach. The hotel boasts a rooftop terrace bar, lobby bar, buffet breakfast restaurant, free wifi throughout the hotel, 24 hour reception and security and air conditioning. We recommend that all delegates arrive on Monday 2nd October 2017 for a meet and greet with the group and coaches. – Four mornings of live trading and education with Trading College MD Lee Sandford and our head Coach Federico Bustos. – Pre-event webinar to get you tuned in. – If you have any further questions please call us and we’d be happy to help!